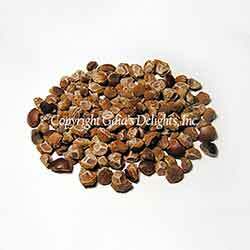 These organic, untreated Hawaiian Baby Woodrose (HBWR) seeds are imported directly from Mauii and inspected for freshness and quality upon arrival. These are our prized seeds and they're getting more and more difficult to find each year. These organic, untreated HBWR seeds are imported directly from Mauii and inspected for freshness and quality upon arrival. These are our prized seeds and they're getting more and more difficult to find each year. Please don't be fooled by inferior seeds sold for less; these seeds have an average germination rate of about 95%, unlike any other Hawaiian Baby Woodrose seeds we've purchased elsewhere. Sold by weight, not by quantity. Our Hawaiian Baby Woodrose seeds also have been verified by an independent lab for authenticity and quality, and these are always sold first come, first serve. These seeds are the seeds that most HBWR seed enthusiasts are familiar with. These seeds have a fuzzy coating, and need to be scored and soaked in water prior to planting to ensure germination. Seeds of the Argyreia nervosa may have once been used in sacramental rituals in the Pacific Islands by high priests, but research is quite spotty. But, it's the beautiful plant that comes from these seeds that's the truly magnificent thing about Hawaiian Baby Woodrose Seeds, and especially this prized Hawaiian strain hand-picked from farmland specifically set aside in Hawaii to grow these seeds. Properly cultivated this plant would make an absolutely lush, beautiful, and colorful addition to any garden. When coated with pesticides and fungicides, it can not only lessen the viability of Hawaiian Baby Woodrose seeds, but it can also weaken the strain as well. Avid gardeners can buy HBWR seeds imported from Ghana, the Pacific islands, Spain, India, but few compare to the quality and germination rates of the few grown on just a few small organic farms in Hawaii. Trust the people who have been sourcing Hawaiian Baby Woodrose seeds for over 5 years, and who not only take great pride in their products, but who care deeply about species preservation as well!